It wasn’t quite the debut the equally trendsetting Lotus 25 Climax and Lotus 49 Ford made in ’62 and ’67 respectively, but Jochen popped it 8th on the grid and then failed to finish, his Cosworth DFV had ignition problems. Jackie Stewart won the race in Ken Tyrrell’s March 701 Ford. I like the shot as it shows the car as Maurice Phillipe originally detailed it. The jewel of a thing won at Zandvoort on June 21, 2 months later as a Lotus 72C! It evolved from 72, 72B to 72C spec in 2 months. Jochen loathed the 72 in its original form. It had severe handling deficiencies, the car rolled excessively and lifted inside rear wheels. The anti-dive geometry made the light steering lack feel as the suspension stiffened under braking. Anti-squat was suspected of inducing a diagonal jacking moment across the car causing that inside rear wheel to lift in corners. Chapman prescribed a raft of changes including removing the anti-dive and anti-squat aspects of the cars suspension geometry front and rear. It’s easy to say but involved Hethel’s fabricators unpicking the cars lovely aluminium monocoques to change the suspension pick up points at the front, and to make a new subframe at the rear. Chapman, not only one of the design greats but also a race engineer of extraordinary ability and perception turned a ‘sows ear into a silk purse’, the car famously winning its first titles that year, Rindt’s drivers championship posthumously of course. Other changes to the car before the French GP, held that year on the rolling glorious roads of Clermont Ferrand included stiffening the rear of the chassis by cross bracing it, fitting stronger suspension pick-up points and re-siting the rear Koni shocks which were being ‘fried’ by hot air exiting the hip radiators. Checkout the following in the first photo at the articles outset; the monocoque ending at the front, drivers feet bulkhead, fabricated tubular steel front subframe and all it supports. The infamous inboard front brakes are clear, a design tenet of the car was reduced unsprung weight. I can’t see the front torsion bars, but the lack of co-axial coil springs and use of long solid torsion bars as the springing medium was also revolutionary at the time. The front battery is handily placed to be removed in the event of a front impact, as is, sub-optimally, the onboard fire extinguisher. The front of the 72 is far less ‘butch’ or strong, than, say, the ‘full monocoques’ of a 1970 BRM P153, or a McLaren M14 but the perils for racing drivers of frontal impacts at any speed in all of the cars of the period are clear in this shot. 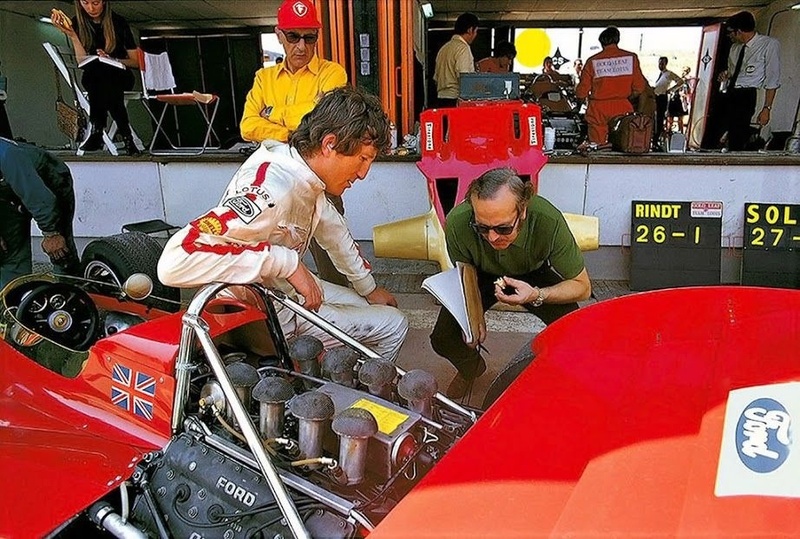 Note the hip-radiators, Chapman was playing with weight, which he placed increasingly onto the rear of the car over the 72’s long, 1970-75 life as well as aerodynamics. 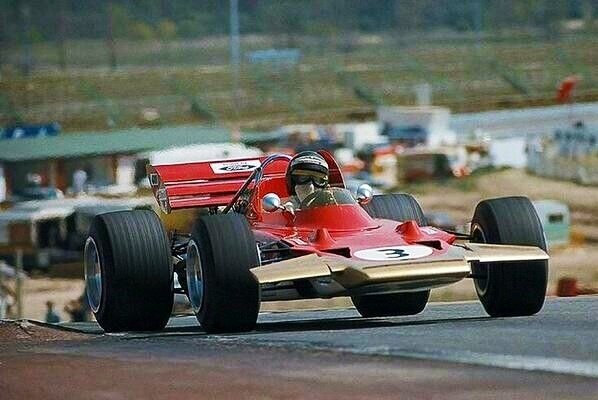 Still, the wedge wasn’t new, his 1968 Lotus 56 Pratt & Whitney Indycar first deployed the approach. Oi…What LB would the torsion bars have to be ??? I suppose if he front springs at 45degrees to verticle would of been used ..and they had 600lb springs .. would that mean 300lb wheel rate .. so torsion bars would be 350 too ??? Stick to broking Pal, I don’t want you fettling anything I am going to put my bum in! Phew, the 72’s ground clearance in the Tailpiece photo would put a Mazda CX-3’s to shame! All 6 inches of it. Was at Brands Hatch British GP in 1970 and thought Brabham won because he was leading when he went by us on the last lap.. We were a long way from the finish line. Then they said Rindt won. Complete confusion all around. The PA was useless. Finally, an old farm tractor pulling an ancient trailer came trundling by with the Lotus loaded on the back of it, and Rindt waving to the perplexed crowd. Strange parade lap. I’d seen better support vehicles back in local stock car racing in Nova Scotia! Turned out Jack ran out of gas on the second last corner, and Rindt passed him. Then they apparently got upset with Rindt’s wing. I tell you, we the mushrooms in the crowd out on the course were kept in the dark and fed BS for ages by the babble on the public address. What confusion! 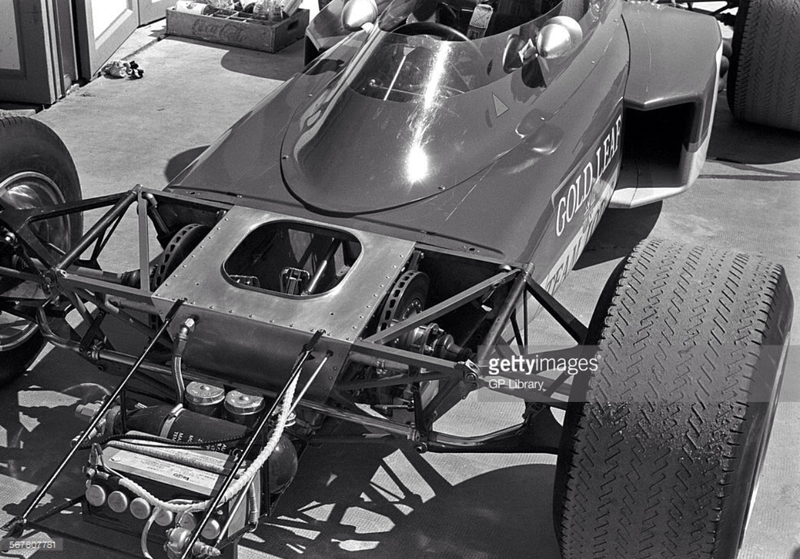 Did they bend the wing loading the Lotus on the trailer? Anyway, we were home making a giganto Desperate Dan Cow Pie when the Beeb confirmed Rindt’s win. Amateur hour all around by the organizers. Real memory of that race was the Matra V12. It sounded as if it were in exquisite pain, the Hunchback of Notre Dame playing the cathedral’s organ it was so loud and pipey. Too bad Rindt bought it less than two months later. Yup, too bad. What a great anecdote and memory of the day- off to the Australian GP carnival this weekend- the one thing which has progressed down the decades is big screens at the circuit and radio transmission you can hear with earmuffs on- we can at least decipher the race! The 72 is a favourite car- 1970 was the year I became interested in motor racing. 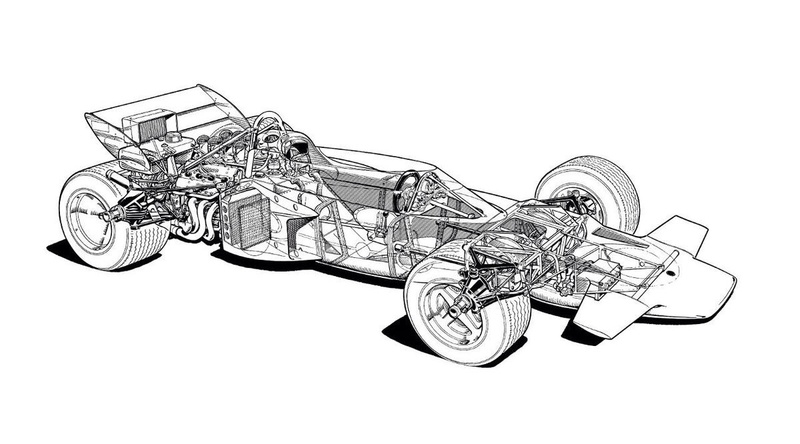 Many inches of 72 ground clearance to the ground effect of the 78/9 in 7/8 years- amazing! It will be very interesting to see the new cars tomorrow!